Instinct Raw Boost Puppy is a high-priced dog food with great quality. This product has no controversial ingredients, including zero artificial preservatives, colors and flavors - that’s fantastic. It has very well-balanced amounts of protein, fat and carbs, with excellent meat and fat quality. 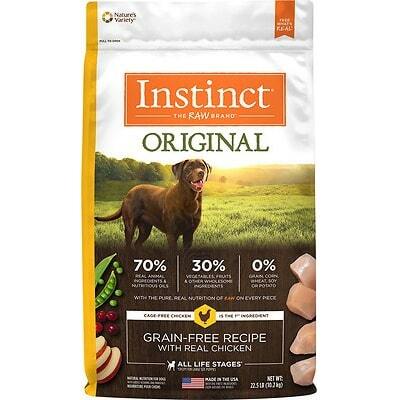 It is good to be aware that Instinct has an above-average number of dog food recalls, but the company was extremely transparent when answering our questions. Watchdog Labs recommends this product. The average dog food we reviewed has 39 total ingredients, with 1 controversial ingredient. Instinct by Nature's Variety Raw Boost Puppy Recipe has 0 controversial ingredients, absolutely excellent. Zero controversial ingredients are in this food, as we pointed out above. That’s really great. This food is made in the USA. It means that Instinct by Nature's Variety Raw Boost Puppy Grain-Free Recipe has to follow stricter quality guidelines when being made, compared to many other countries. 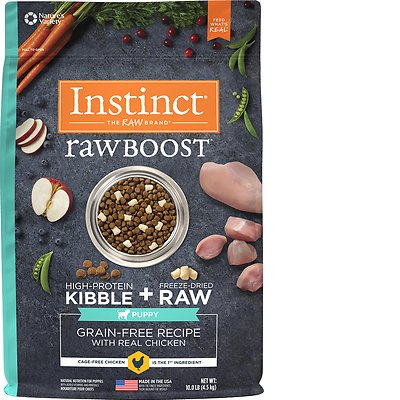 Instinct by Nature's Variety Raw Boost Puppy Grain-Free Recipe uses a variety or protein and fat sources, including: Chicken, Chicken Meal, Turkey Meal, Chicken Eggs, Chicken Fat, Menhaden Fish Meal, Freeze Dried Chicken, Lamb Meal, Freeze Dried Chicken Liver, and Freeze Dried Chicken Heart. What makes all of them higher-quality is that they clearly name the animal they come from, instead of just being generic sounding ingredients like “Poultry” or “Fish” - all of this is a sign of quality. Looking at the dog food ingredients, this product contains no controversial preservatives. Note that ‍not all artificial preservatives are bad. That’s because they serve an important purpose, which is to prevent food from spoiling. However, we consider 11 artificial preservatives controversial because of their potential link to cancer and other serious health conditions. 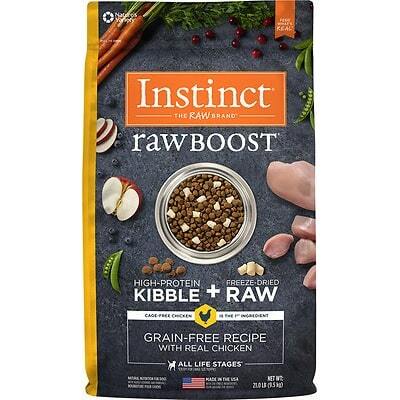 Instinct by Nature's Variety Raw Boost Puppy Grain-Free Recipe includes zero artificial colors. No artificial flavors are used in this product, either. This dog food manages to ace all three “artificial ingredients” tests. Nature’s Variety made solid choices in these areas of food quality. We found that one of the bigger challenges for a company is maintaining a supply of all ingredients to make their products. So the bigger a company is, the more likely they will need multiple suppliers, some who source raw materials from China.